Of course, you love jewelry! Who doesn’t, which is why exploring the JCK Las Vegas show should be on your list of top places to visit over the next few months. With less than 2 months for the show to start in full swing, we hope you are ready to be dazzled by all the gems, jewelry, and designs on display. The Mandalay Bay Resort and Casino in Las Vegas will have you wishing you could buy much more than just a few indulgent treats. With the latest trends being showcased at the JCK, they are introducing their new layout that aims to give each designer the attention they deserve without much alteration. Timeless pieces don’t necessarily have to be made in fine metals, and you will be seeing just that at North Americas leading jewelry event this year. Why you ask? The JCK Las Vegas show will also feature a section dedicated to “Bridging the Gap”. This enables customers to buy flawlessly made costume jewelry at accessible price points. You don’t always need fine jewelry, which is why this concept will give you the opportunity to buy pieces that will last you a lifetime and are yet stunningly beautiful. Colored gems are taking the world by storm. Their vibrant hues have a sort of magnetic force that keeps bringing people back to them. This season reds, pinks, blues, and purples are some of the colors being used by designers in their collections that will no doubt become both priceless and timeless. Do look out for JupiterGem at the show as we will be around networking, meeting gem traders, gem collectors and jewelry collectors discussing gems and their lures. Some of the stones we will be focusing our attention on are Padparadshas as their dual tones of pink and orange have become a real crowd pleaser, Pink Sapphires because they resonate feelings of love and wedding season can never be too far away and, of course, natural Alexandrites because of their phenomenal color changing abilities. Coupled with both strength and beauty these stones will surely take your breath away. Not only that, JupiterGem can also show you some options of jewelry at affordable price points available in 18K gold set with a variety of gems and diamonds to give a chic yet simplistic appearance. So come register yourself at the JCK Las Vegas show, and gift your eyes a treat to design and jewels alike. Visiting Tuscon in the month of February? 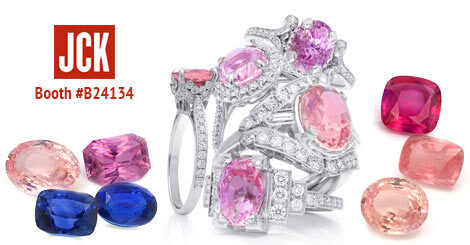 Join us, JupiterGem, at the Tuscon GJX Show , Booth #409/509 in February this year between the 2nd to the 7th. The show is one of the world’s leading platforms offering gems and jewels within all categories, under a single roof. From fossils that have been unearthed plenty of years ago to some spectacular gems that can reach astounding prices, the GJX has it all. This 6-day show has a range of visitors from over 20 countries that come to source gems; jewelry and minerals as the GJX, has now become an important lapidary and fossil gem show worldwide. Offering all the facilities you can imagine, the GJX now brings together over 700 booths from the different gemstone hubs of the world like Jaipur, Bangkok, and Antwerp. A kaleidoscopic of colors is what you should expect to see at the GJX. Strings of Tourmalines, Rainbow Moonstone, Aquamarines, Rubies, Fire Opal and Rose Quartz are just some of the stones you will see. Inanimate necks take on a new life as they display large beads of Red Spinels and Emeralds because of their vibrant color. Rings in all the sizes you can imagine studded with Black Fire Opals, that resonate with a colorful mosaic are sure to leave you wanting one. Earrings with perfectly matched pleochroic Alexandrites accompanied by Diamonds give you perfect balance. The show has been designed to bring together passionate gemstone traders, and this is just the emotion you will feel throughout the show. Stalls with gemstones lit in just the right angles enables you to see ideal colors through each gem. These booths always have onlookers collecting in front to get the right picture, capturing what looks like a constellation within each gem. Constant gossip about the current trending prices for Rubies, Emeralds and best selling gems like Padparadschas is what can be overheard through everyone’s conversations. JupiterGem, having started in 1973, has always strived to provide our clients with unparalleled quality and service and has grown vertically through the market over the years. We now sell all our niche market over the web through our website that caters to gemstone traders, collectors and jewelry shoppers across the world. Our collection of stones and jewelry displayed at the GJX are well over 10,000 pieces, giving you a variety of options to help make the right decision. With a stall you won’t want to miss, our vast collection of gems and fine jewelry fabricated in gold, white gold and rose gold are made with impeccable standard and are each, a one of a kind piece. From wedding bands to uniquely handcrafted pieces our jewelry is made to enhance and compliment each gemstone used in its setting to suit its wearer and compliment her natural features. We specialize in some of the best quality Padparadschas, Sapphires, Morganites, Alexandrites, Rubies and Aquamarines are only a few of the options we maintain within our inventory. So if you’re looking for the right gem, selection of jewels or even that one statement piece that will last a lifetime, Come visit us at the Tuscon GJX Show, Booth #409/509 and you will surely find what you are looking for! If you began to hum that in a Christmas melody, let’s take a minor step back. For those of us in the jewelry industry, the most wonderful time of the year is not necessarily Christmas (although gems over the holiday season are never frowned upon), but rather February, April, May and September. These are the months that the Gem and Jewelry fairs and Trade shows happen, and can bring inspiration and vision to designers and retailers alike. The gambit begins in April, with the Beijing Jewelry Expo. As the suppliers and manufactures from Taiwan, Hong Kong, Macau and China gear up with their best of the best, high end jewelry companies head to the Eastern side of the globe to source out newly crafted masterpieces that will begin their way into North American showrooms. The buzz is frantic as cultures collide in these hectic floors, but professionalism and opulence hangs in the air heavier than the smog. Newcomers may feel a bit like Marco Polo on their first visit, surrounded by foreign merchants peddling their wares in an unfamiliar land, but that soon fades as the gems take center stage and the business talks begin to unravel. Jewelry is, after all, the international language. After that, it’s off to the desert to explore the Jewelers' Circular Keystone (or as known in the industry “JCK”) trade show in famous Las Vegas. Although the vibe of city suggests it, you’ll be lucky to find a gambler on these showroom floors. The halls are filled with shrewd and savvy sharks, who may be emphatically passionate about gems, or a perhaps just caught up in the intensity of what Sin City has to offer. Regardless of the reputation of its location, however, this tradeshow is bountiful, exciting, extravagant and informative as exhibitors always go above and beyond to bring clarity to their precious commodities. It’s truly an oasis of professionalism in a dry sea of mischief. As we round the corner into September, the Hong Kong Jewelry & Gem Fair emerges, bringing its own flavor into the Expo world. As it is a free port, setting no duties or restrictions on jewelry products or related materials it has become a favorite for worldwide traders looking to expand their product base or source out new and influential contacts. It boasts 135,000 sq metres of exhibition space that focuses on fine and finished jewelry, packaging tools, equipment and loose gems, making your walk through their two enormous venues seem like a beautifully endless stream of goods and fortune. As the annual circuit completes, those looking to source out stones of exquisite nature find themselves anxiously anticipating the distinguished GJX Gem show. This show, located in beautiful Tucson, Arizona has grown exponentially since its initial launch in 1993 based on its uncanny ability to perfectly connect the right people to the right products. Those who have made their way to this rapidly growing show find themselves banking as much time as they can in the trade show halls, forgoing the opportunity to explore the local fare or sights in order to take in as much of this symposium as possible. While there are some great trade shows that are based all over the world, we at JupiterGem have found these 4 to be the leaders in service, product, value and integrity. We are excited to offer our clients the benefits of what these shows have to offer, and stand tall on our platform of immeasurable quality that we give to our clients. Please make sure to bookmark our page and revisit us often to see what these ventures will eventually bring to our clientele and patrons. Our most wonderful time of the year can also be yours!